The Family Guy-Microsoft story has been tearing this country apart for too long. No more! Seth MacFarlane & Co. have found a new sponsor for their Almost Live special, and it’s none other than the movie Sherlock Holmes, which stars Robert Downey, Jr.
You’ll recall that Microsoft dropped its sponsorship of the show last week when it saw a rough cut of the special. Too raunchy, said Microsoft . No it’s not, replied MacFarlane. Well, we’re leaving and taking our money, said Microsoft. Oh boy, replied MacFarlane. But there’s nothing to worry about, for Warner Bros. has stepped in with its checkbook and credit line to save the day. 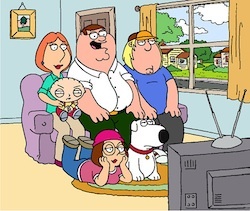 It’s good news for those of you who still watch Family Guy.